The US Federal Energy Regulatory Commission (FERC) has issued a favorable environmental impact statement for the Northeast Supply Enhancement Project, allowing the Transcontinental Gas Pipe Line Co. (Transco) project to move forward. Transco, a Williams company, filed its application with FERC in April 2018. The project is an expansion of Transco’s interstate natural gas transmission system in Pennsylvania and New Jersey, USA, and its offshore natural gas pipeline system in New Jersey and New York waters. The project will enable Transco to provide 400,000 dekatherms per day of firm transportation capacity from Transco’s Compressor Station 195 in York County, Pennsylvania, to Transco’s offshore Rockaway Transfer Point, an existing interconnection between the Lower New York Bay Lateral and the Rockaway Delivery Lateral in New York State waters. The addition of a 21,902-hp (16,338-kW) hp electric motor-driven compressor unit at Transco’s existing Compressor Station 200 in Chester County, Pennsylvania. A new 32,000-hp (23,872 kW) compressor station in Somerset County, New Jersey near Transco’s mainline, consisting of two turbine-driven compressor units (Compressor Station 206). A 10-mile (16-km), 42-in. (1066-mm) loop of Transco’s mainline from Mile Post 1681.00 to Mile Post 1691.17 in Lancaster County, Pennsylvania (Quarryville Loop). A 3-mile (5-km), 26-in. 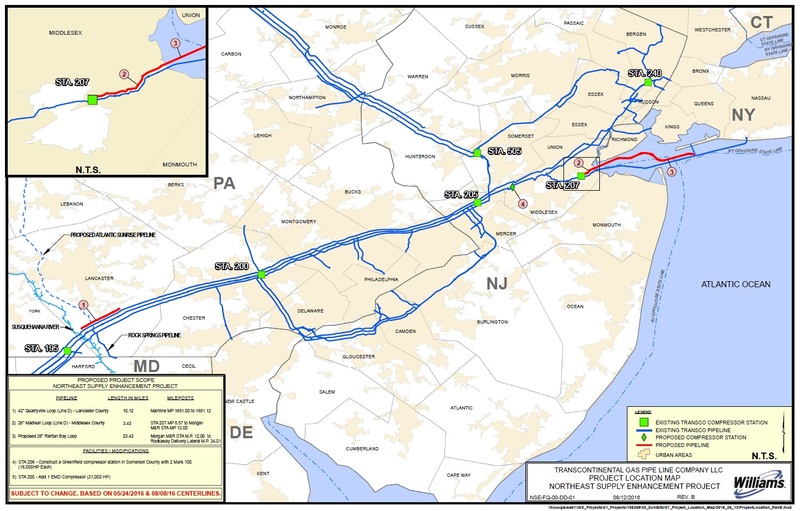 (660-mm) loop of Transco’s Lower New York Bay Lateral 2 from Compressor Station 207 at Mile Post 8.57 to Mile Post 12.00, southwest of the Morgan M&R Station in Middlesex County, New Jersey (Madison Loop). A 23-mile (37-km), 26-in. loop Transco’s Lower New York Bay Lateral 3 from Mile Post 12.00, southwest of the Morgan M&R Station in Middlesex County, New Jersey, to the Rockaway Transfer Point in New York State waters (Raritan Bay Loop). Additional facilities, such as mainline valves, cathodic protection, a communication tower, internal inspection device launchers and receivers, and related appurtenant underground and aboveground facilities. Transco estimates the cost of the project to be approximately US$926.5 million to be in service by December 1, 2019.